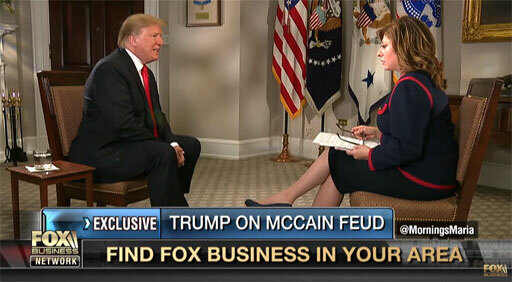 Things got testy between Donald Trump and Fox Business News host Maria Bartiromo on Friday as she asked about his continuing attacks on deceased Sen.John McCain. Here's Donald Trump indicating that Maria Bartiromo broke some sort of agreement not to mention his attacks on John McCain, then calling her "fake news." Anything less than complete fealty is punished. Earlier this month, Trump mentioned McCain during a press event with Brazilian President Jair Bolsonaro: “I’m very unhappy that he didn’t repeal and replace Obamacare, as you know. He campaigned on repealing and replacing Obamacare for years." “I was never a fan of John McCain, and I never will be," he added.